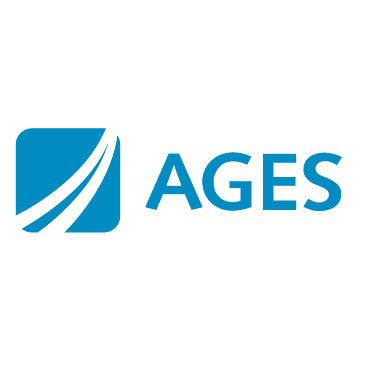 AGES is one of the leading European service providers for road user charges. The company founded in 1994 has many years of experience in developing, implementing and operating country-specific and transnational toll systems and has access to an extensive partner network. The services of AGES include the administration of customers, POS networks and payment transactions. AGES is responsible for an annual toll volume of about four billion euros as well as the operation of around 4,000 points of sale in 13 European countries. 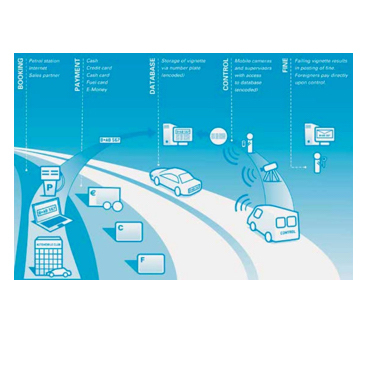 With AGES, customers get a trustworthy partner for reliable and convenient toll systems. The electronic Eurovignette replaced the paper-based system on 1st October 2008. As the operator of the new system, AGES ensures the successful development, implementation and operation of all required facilities including the control centre and network with approximately 500 points of sale. The entire Eurovignette countries with the four member states (Denmark, Luxemburg, the Netherlands and Sweden) as well as the neighbouring countries (Belgium, Finland, France, Germany and Great Britain) are covered by it. Booking The driver acquires the right of use via the Internet, via a smartphone or at a point of sale, e.g. at the petrol station. Payment All major means of payment from cash, credit card to fuel cards and electronic cash are accepted. Database The e-Vignette is stored and encoded in a central database under the registration number. Control Compliance with payment rules is ensured via proven, privacy-protected methods, e.g. radar controls. With the help of a portable monitoring device, the registration number of the vehicle to be checked is recognised automatically, encoded and compared with the centrally stored rights of use, also encoded. If there is no violation, the data is deleted immediately. Fines In the case of an unauthorized road use, proceedings to impose a fine will be initiated without delay. Stopping the respective vehicle would be necessary only in the case of foreign vehicles which might otherwise be able to escape such proceedings.